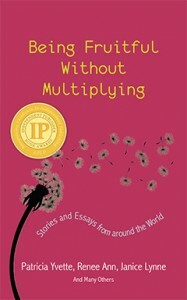 Being Fruitful without Multiplying: Stories and Essays from around the World ($14.95, 226 pages, ISBN: 978-1-60381-155-2), is an anthology of true stories by many women and a few men revolving around the elements of nature and nurture that led to their decisions not to procreate. The introduction is by Patricia Yvette, and the main stories are written by Patricia, Renee Ann, and Janice Lynne. Gold Medal Winner in the 2014 Independent Publishers (IPPY) Awards (Women’s Issues). Finalist in the Women’s Issues category of the 2015 Next Generation Indie Book Awards. Also available in Kindle and in other eBook formats on Smashwords. The project began as a memoir by three authors with family ties and ended as a conversation that included women and men ranging in age from twenty to sixty-one. Seventeen states and thirteen countries outside the U.S. are represented. —Laura S. Scott, Author of Two Is Enough: A Couple’s Guide to Living Childless by Choice and Director of the Childless by Choice Project. Childfree, childless … these are the labels society gives to women who do not bear children, due to choice or genetics. Being Fruitful without Multiplying started as one woman’s quest to come to terms with her decision not to bear children. In conversation with Renee and Janice—two close relatives from different generations—Patricia found that they shared another, unexpected bond: each belonged to childless or childfree social networks. All three were weary of questions from well-meaning people who wondered why they had not born children. As they began to reach out to others in earnest, they found that many who belonged to their diverse online communities were eager to share their stories. Some had chosen to be childfree and some were childless because of biological factors but grew to appreciate the advantages. Some of those who chose not to reproduce still decided to become stepparents or adopt. Over sixty women and a few men added their voices to those of the three main authors. The result is this rich and varied anthology, which includes stories from many different countries, cultures and income groups. The primary authors of Being Fruitful Without Multiplying are three close relatives of different generations who began discussing their reasons for not bearing children shortly after a family reunion. Patricia Yvette was raised an Air Force brat and so grew up in various locations abroad. She has a master’s degree in Marketing Strategies, and is currently pursuing her PhD. Her career has been based in a Seattle aerospace company for the past twenty years. Married over twenty five years, she enjoys traveling, culinary art, outdoor recreation, and considers herself a life-long learner. Renee Ann has served as a Christian missionary and traveled extensively through West Africa where she encountered an enlightening way of life. Life-challenging events altered her attitude toward the religion she was raised with and once advocated. She is now an aesthetician. Janice Lynne has worked in the travel business for the past thirty-two years. She was Sales Director with a major cruise line for twenty-eight years and is currently Vice-President of Sales for a small boutique cruise line. She has been named Sales Person of the Year numerous times. Janice is a world traveler, stepmother, and published author of three children’s books. Click here to find the authors online. Those six years of babysitting adventures were more than enough to help me realize all the time, effort, and money required to raise children. Sure, the kids were sometimes adorable and fun to be around, but they also required major disciplining. Every girl should babysit during her teenage years. Babysitting may well provide the best possible incentive to postponing sexual activity. During my babysitting jobs I saw a lot of poor parenting. Once I actually called my mother to have her bring over food supplies for the kids I was caring for, because there was nothing in the refrigerator but old take out and several bottles of beer. It was truly pathetic. Witnessing this kind of neglect made me pity the girls in high school who purposefully or accidentally became pregnant. I was hugely motivated to practice abstinence—not the easiest thing to do when you are surrounded by friends engaging in sexual activity, insisting that you are missing out. One of my best friends discovered she was pregnant by a boy who had also impregnated another teenage girl. Her life changed instantly. It was about this time that I focused my energy on finding work and didn’t look back. Despite these highs I was often shocked by the rife poverty and overpopulation. Although I had witnessed tremendous poverty in other African countries I had visited, I saw Ghana as so much worse. The population density probably made this more readily apparent. It was painful to see the multitudes of young street children who had come to the city in search of employment. Many of these children had been taken from their homes in distant villages and brought to the capital, where they were exploited by their employers. This “employer” was usually a family relative or acquaintance who had convinced the parents that their child would be better off in the city. It was normal to see emaciated, malnourished children, some even younger than five years old, carrying heavy baskets of foods and other goods on their heads under the scorching African sun. The marketplaces were so heavily congested with people that it was difficult and risky to maneuver through them without getting stepped on or bumped into. The market area smelled profusely of sweaty bodies, raw fish, raw bloody meat, and vehicle exhaust. I understood that ultimately I could do nothing to even slightly reverse the cycle of poverty I was witnessing. As I wondered if anyone could do anything, I grew to detest what seemed to be a pervasive irresponsibility that dominated the culture. Children were being born so rapidly that none of them could ever receive the adequate guidance and individual attention they would need, especially during the crucial early years of childhood. In contrast to what I saw as irresponsible behavior were the Ghanaian women who worked all day long cooking meals, harvesting vegetables from their gardens, and selling the fruits of their labor at the market. Usually they worked throughout the day with their babies wrapped around their backs. African women have always astounded me with their physical strength and fortitude. I have never seen a particular group of women work so long and so hard, and with such patience. Even more amazing was their decision to accept the hardship of their situation with a positive attitude. Complaining, as I found from my own experience, was considered to be very impolite and offensive. After four years in Virginia, my husband changed universities and we moved to Florida, where I found the greatest job in the world as a sales manager for a major cruise line. It wasn’t easy convincing them to hire me. This was the early eighties and the company had never employed a young married woman as a sales representative. The position required a lot of travel and they were worried I would become pregnant. I don’t recall the exact conversation, but I was aware of their concern. I didn’t want to lose this opportunity, so I assured them that I was not going to have children. Today, it’s laughable that this was even an issue. Many women sales reps have had children during the twenty-five years that I have been with the company. Every birth is a celebrated event, and we welcome a new member to our family. I don’t know whether or not they believed me, but I got the job. What a job it was! As a child, I would become easily bored. Never again.